Should the U.S. strengthen ties with the kingdom? U.S.-Saudi relations are warming after years of conflict with the Obama administration. Citing mutual opposition to the Sunni kingdom's Shiite arch-enemy, Iran, President Trump and the Saudi king struck a $350 billion arms deal last year aimed at fighting terrorism and creating American jobs. But critics warn that Trump's unflinching support for the kingdom could pull the United States into one of the regional proxy conflicts between the Saudis and Iran. Meanwhile, the Saudis are seeking U.S. investors for high-tech and renewable energy ventures to help diversify the oil-dependent economy. They also are considering selling part of the massive, state-owned Aramco oil company to outside investors, which would open a window on the kingdom's secretive finances. 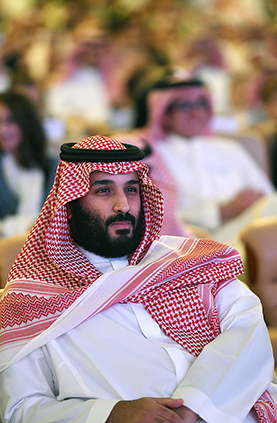 To lure international support and investments, a new, 32-year-old crown prince is pushing social and economic reforms in the religiously conservative society. But human rights groups say the Saudis oppress dissidents at home and continue to fund extremist groups that share their hatred of Iran.